Your ideas are important- we're listening! 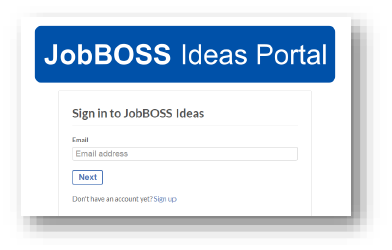 We are excited to introduce the JobBOSS Customer Ideas Portal – an open, customer-driven online community to submit your enhancement ideas! Great ideas can come from anywhere at any time. As you discover new ways to enhance JobBOSS, from changes in product capability to user experience improvements, you can add them to the Ideas Portal at any time, from any device. Once you submit an idea to JobBOSS, our team will provide an initial review, and make your idea public for all JobBOSS users to view, vote, or comment on. You will also be able to see what other customers would like to see enhanced in JobBOSS, how they could better use the product in their own shops, and you vote on the ideas that resonate with you or you also find value in. To ensure you never lose sight of what is important to you and your shop, when you submit, vote, or comment on an idea, you automatically get subscribed to that idea. This means that if JobBOSS moves forward with that idea and implements it as a feature in a future release or chooses not to at a given time, you will be notified at every status change. What does this mean for you, our users? We want to make sure that our loyal customers have a say in what we decide to implement into our product. We want you to know that we are listening to you. And we want to build a great experience for you when you use JobBOSS, and make you an even bigger part of our future. The Ideas Portal will allow JobBOSS to be more transparent with our users on the product direction and deliver the most flexible and customer-centric shop management solution for manufacturers. We are very excited to be publicly launching this platform! Thank you for helping shape the future of JobBOSS! 2. Sign into the Ideas Portal with your professional email address. Click here to do so. 3. Submit your ideas, comment and vote! 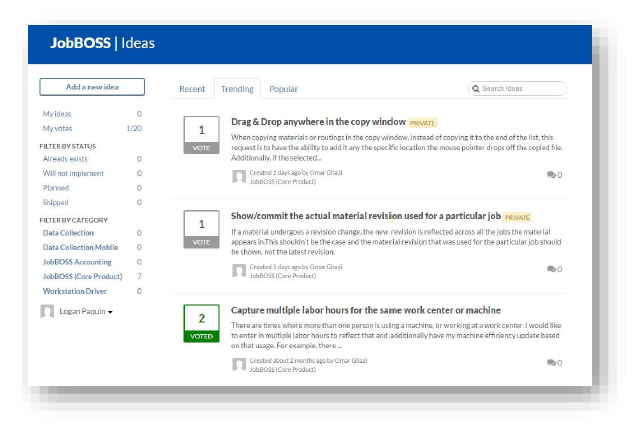 Check back often to see what new ideas are added to the JobBOSS community!